Collect and aggregate reviews from all platforms on one profile – time-saving and always up-to-date. Your reviews make you stand out from your competition in search results – boosting website traffic and orders/requests. Your rating seal builds trust and gets you more new customers – helping you increase sales by 10% on average. I was excited about this concept right away and I still am now. There are a lot of single solutions, but no master class. Only ProvenExpert can offer this! With ProvenExpert, everyone can achieve a sustainable reputational structure that is available anytime, anywhere. Our customer feedback speaks for itself: a 100% recommendation­rate is even better than advertising. The reviews we get from our repeat customers help us really stand out from the competition. Where I previously requested 10 feedbacks, I may have gotten three afterwards. And now I'm calling for 10 and get eight to nine. ProvenExpert is a first-class customer satisfaction analysis tool. It's intuitive and easy to use. Our patients' testimonials are prominently featured on our website, where they build confidence! We ranked third in Google search results after just a few days thanks to our company profile. ProvenExpert makes it easy for my customers to leave feedback — there's no need for them to sign in to let me know what they think. ProvenExpert's email template gets us a 30-40% response rate on all the invitations we send out! With the rating seal on our shop page, we were able to boost our conversion rate by more than 23%. ProvenExpert's cost-performance ratio and personalized service are simply unbeatable. My customers like that they can evaluate me anonymously and in detail. 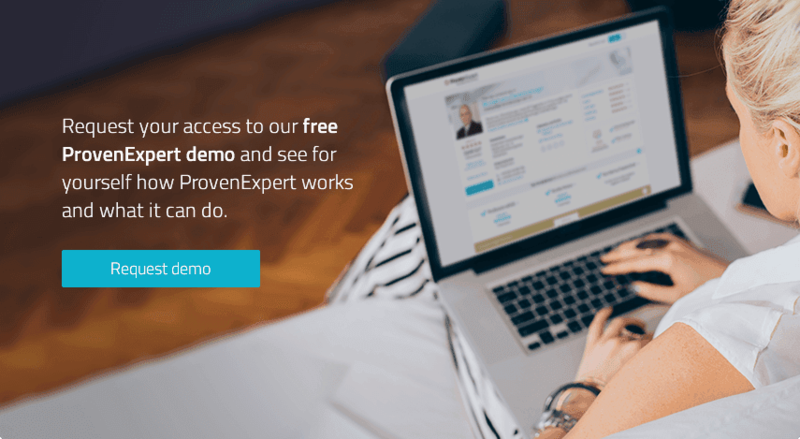 ProvenExpert makes collecting customer referrals and reviews a breeze. We collect customer reviews to attract potential customers and generate new business. With ProvenExpert, I get detailed feedback that is customized to my needs, and I can find out exactly what I need to know from my customers. We're thrilled with how great the customer response has been and how easy the platform is to use. I've only been on ProvenExpert a short time, but my market presence and the number of people visiting my profile have been phenomenal. Our spectacular reviews on ProvenExpert.com have driven a lot of new traffic our way. ProvenExpert.com helps me continuously optimize my overall image. My own ratings are transparent and clearly laid out, and I can easily set myself apart from the competition. The sheer versatility of ProvenExpert has completely won us over. Our reviews have helped us significantly boost our reach — even at the national level. After placing the rating seal on our website, we've seen a 40% jump in new business. With ProvenExpert, we can finally make the most of our generated feedback from all sources and publish it easily. Two things I associate with ProvenExpert: a better reputation and as a result more revenue. of potential customers choose a company or service provider depending on their customer reviews. are willing to pay a price premium for a positively reviewed service provider. 30 days free PREMIUM trial, continue on the FREE plan afterwards.